As the world’s worst housekeeper, running holiday homes wasn’t, with hindsight, a sensible idea. But two collapsing buildings on Susie Kelly’s land would cost more to demolish than to restore. Thus she became a seasonal landlady. Before the guests came the builders. No’s 1, 2, 3 all started promisingly, but by builder No. 4, and with her first guests just hours away, her patience was stretched to its limit. Her summer and winter visitors couldn’t, as they say, be made up, though, to spare their blushes some of them have been air-brushed. They brought with them laughter, tears, romance, friendship and occasional madness. And they all left behind jars of jam and pots of pepper. From them Susie learned that you don’t need to travel to find adventure. If you run holiday homes it comes to your doorstep. Unfortunately for Susie this included Ivy. The cleaning lady from hell. Swallows & Robins - The Guests In My Garden is yet another great read from Susie Kelly. I devoured it in just two sittings and just like her other books it made me genuinely happy. 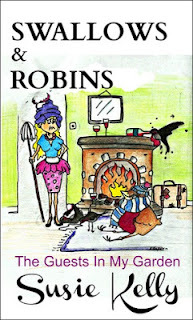 Her books have such an air of lightness, humour and fun experiences that for me is impossible not to like. They're all well written and very difficult to put down. Kelly's books are my go-to-books when I'm feeling down or just need something easy and bright to read. Her various adventures are often both difficult and straining on her, but they are so much fun to read about. The summary in the grey box really says all else that needs to be said, all I can now do is urge you to spend some happy hours reading it. Thanks Iben. 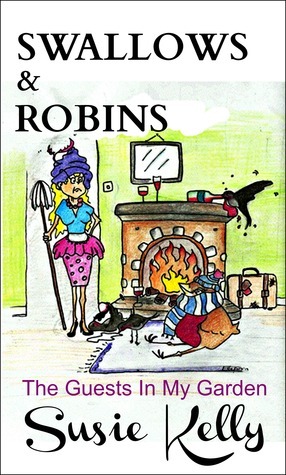 As Susie's publisher I couldn't agree with you more, and Swallows & Robins shows her in top form.